Animals, wild and domesticated, are frequently depicted in fine art. They are anthropomorphized and they are portrayed as symbolic children, symbols of danger and brute force or archetypes of the natural world in general. Yet, there’s always a barrier between our world and theirs, a block to our understanding of them, in spite of our co-existence with them on the earth. Local artist Claire Taylor seeks to arrive at an understanding of the world of animals through her drawings and printmaking. Animals achieve connections with one another but also with the viewer through symbolism; it’s an attempt to use art to feel closer to nature. Her new collection at Art Access Gallery displays reveals that awareness. She describes her depiction of animals as “otherworldly and magical,” and adds, “these animals’ sense of self, and their relationship to the physical and spiritual world and others in it, takes a pure, concentrated form.” Her view of animals is an idealized one, but it’s also a compelling one—aesthetically as well as emotionally—and something the viewer can respond to, because it’s formed from her own experiences with animals. The experience that made the deepest impression, she says, happened during a nighttime run in the Avenues. “I passed a stop sign, and right afterward, I heard a ‘bong!’” she recalls. “I turned around and a small owl had landed on the stop sign after I had passed it. I stood there staring at the owl, and the owl at me. After a few moments, another owl swooped down, touched the grass between me and the sign and flew up into a tree.” She stood staring at the first owl, but then ended her run early, as things felt too intense. It’s a challenge to capture not just the essence but the reality of the world for other creatures—their experience of living in the world and the way they relate to each other. 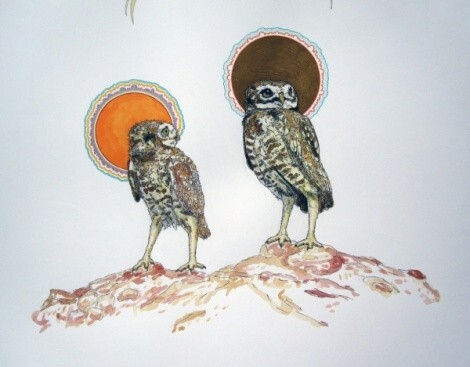 Her artistic style is realistic, but with surreal and mystical touches, like auras around the heads of owls and dotted lines emanating from owl to wolf as though they were projecting energy fields. This is slightly reminiscent of American Indian art, but also modernist minimalism. With a degree in printmaking from the University of Utah, she works in the book arts department of the Marriott Library on campus, and she uses the program’s presses and other equipment to make letterpress prints. Her work, overall, has a look that’s very clean compositionally, as well as a clarity of line that shows the influence of book illustration. Taylor’s work is shown alongside the animal sculptures of Tim Little, who fashions his pieces from recycled metal parts from cars, cameras, bicycles and even dead tree stumps.